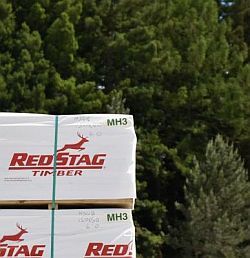 The Red Stag Timber Company, which annually processes more than one million tonnes of logs at its Waipa mill, is using its waste wood as renewable fuel rather than trucking it to landfill and paying for its disposal – avoiding an annual power bill of up to NZ$1 million in the process. Although the mill, considered one of the largest of its kind in the world, uses the power for its own purposes, the 7.5 megawatts of electricity produced is equivalent to the amount needed to power 7000 households, according to the company’s operations manager of energy and site services Shane Batchelor. With the average New Zealand home containing 2.7 people this would be enough for a town of about 19,000 like Whakatane. At the same time by using its waste wood as fuel instead of purchasing electricity, Red Stag is expecting to reduce carbon emissions by 6100 tonnes every year, an amount equivalent to taking more than 2200 cars off the road. Mr Batchelor says the multi-million dollar “carbon neutral” energy management project – made possible by the site’s biomass-powered turbines – will lead to an annual NZ$1m of power savings for the company. Because the new process is generating more electricity than the plant needs at some off-peak times and on weekends, it is selling its surplus back to the national grid. “We should be able to turn that NZ$1m loss into income of about $500,000 per year,” Mr Batchelor said. The bio-fuel project, which supplies the electricity and thermal energy to kiln dry timber, has been supported by the Energy Efficiency and Conservation Authority (EECA). The authority, which funded a feasibility study into the opportunity, says Red Stag’s second biomass-powered turbine could really close the loop on their waste-to-energy program and define their independent status as an energy efficient and low carbon business. Mr Batchelor says the plant annually produces around 100,000 tonnes of wood residue including bark, sawdust and shavings from the mill’s planers. Previously this waste was transported at both environmental and financial cost to landfill although some was also used at the Tasman Pulp and Paper Mill and by farmers for animal bedding. The project has gathered momentum following the June commissioning of the mill’s new turbine and comes little more than a year since Red Stag completed a NZ$60 million upgrade to a new sawmilling line, part of a $140 m upgrade program. This turned the mill into the southern hemisphere’s first “super mill” – a term the industry uses in recognition of a plant processing more than one million tonnes of logs a year. While there are a number of similar mills in North America and Europe, the Red Stag operation – which employs over 300 people and annually produces more than 500,000 cubic metres of timber – is the first in this part of the world. Mr Batchelor says the bio-fuel project is consistent with Red Stag’s philosophy of not only seeking energy efficiencies but creating a better environment and product. “It is the result of the company dreaming about what is possible,” he said.